Established in 1971, Irish Waste Services Ltd is a leading waste management firm operating out of Belfast. It is a progressive, professional and innovative company with long and valuable experience of the full range of waste management issues. The company’s reputation for a professional and responsible approach to waste management has been developed over its 45-year history. It has continually led the way in promoting environmental awareness in Northern Ireland, going back to 1978 when it introduced the first articulated tankers to the province. 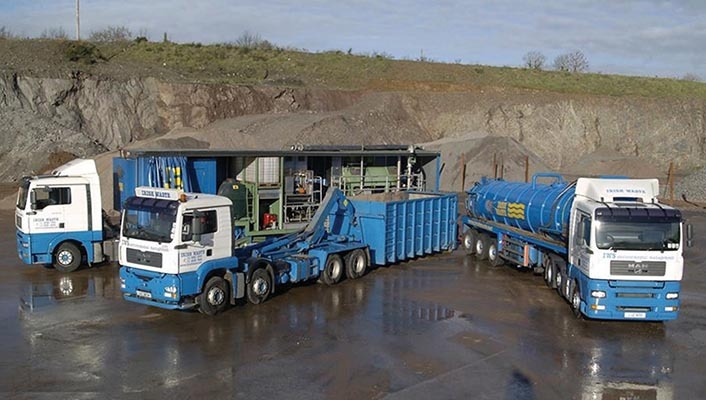 In 1985, Irish Waste Services designed, built and operated the first articulated high flow jet vac units in the UK, which are still in operation today. Four years later, it introduced the first underground CCTV and sewer tracing units. In 1995, it opened the North’s first liquid waste treatment facility. More recent milestones have included the development of a bespoke IT management and waste traceability system in 2001, the introduction of a mobile centrifuge decanter system in 2004, the development of an oil recovery plant in 2009 and the design and installation of a bespoke round gully and street sweeping recycling facility in 2014. Irish Waste Services adheres to the highest industry standards, something that is reflected in its extensive portfolio of licenses, permits and accreditations. These include ISO 9001:2008 – internal quality management, ISO 14001:2004 – environmental management systems and OHSAS 18001:2007 – occupational health and safety. It holds all the relevant waste transport and waste treatment licenses and operates a fully specified and licenced ADR fleet. Over 90 per cent of the waste treated by Irish Waste is recovered or recycled. The company aims to provide total waste management to a wide range of industry sectors and have a complete commitment to professional customer service, allied to ongoing technological development to help its customers’ reduce waste and address their environmental responsibilities. It will manage your waste effectively to maximise the benefits to you and to the environment so that you can concentrate on your core business. Due to their modern standards of living, high levels of energy consumption and the limited natural resources at our disposal, Irish Waste Services recognises the need to focus on recycling and reuse of the materials producers classify as waste. The Carryduff-headquartered concern – it also has a treatment facility on 116 Duncrue Road, Belfast and an office in Ballsbridge, Dublin 4 – aims to develop processes and facilities to direct wastes from environmentally irresponsible disposal outlets and focus on waste reduction, recycling, recovery and reuse. Irish Waste Services caters for a wide range of industry sectors, ranging from aerospace and automotive to construction, manufacturing and pharmaceutical. The full list of industrial services it provides are: mix lab chemicals; skip and bin hire; confined space and breathing apparatus entry services; oil spillage clean-up; oil collection and recycling; mobile lime stabilisation plants; mobile dewatering plants; hazardous liquid waste removal and transportation; liquid waste removal and transportation; high pressure sewer jetting; pumping station cleaning; lagoon cleaning; tank cleaning; compactors; rear end loaders; RORO skips; baled waste collection; secure industrial shredding services. Commercial services available are: secure industrial shredding services; installation of septic tanks; blocked drain clearance; CCTV surveying; vehicle waste and silt trap cleaning; interceptor maintenance and cleaning; industrial septic tank and cess pool cleaning; compactors; rear end loaders; RORO skips; skip and bin hire. Package waste services include: laboratory waste collections; haz pack for mixed waste streams; ADR licensed vehicles / drivers; compactors; baled waste collection. The commercial waste treatment and recycling services are: skip hire; compactors; rear end loaders; RORO skips; dry mixed recyclables; material waste facility; baled waste collection. Hazardous waste treatment and recycling services: WEEE; production of process fuel oil; thermal drying plant; battery recycling; transfer station service; lab waste treatment; paint waste recovery; solvent waste recovery; precious metals recovery; contaminated soil; acid / alkali neutralisation; physio chemical treatment. Non-hazardous waste treatment and recycling services: material recycling facility; food and agri waste; road gully and street sweeping; sewage sludge treatment. Bespoke treatment services: design, build and operation of facilities; on-site facility management. Irish Waste also specialises in reporting and can provide all of its customers with detailed information on the waste volumes they have received and their service costs. Through its bespoke IT platform, it has developed reporting which will not only provide everything from the initial customer enquiry and quotation to service details to invoice and all of the supporting documents, but also a full and complete breakdown of their waste treatment process, how the waste is recycled along with the necessary regulatory codes such as EWC, SIC and R&D. In addition, the system has the flexibility to provide bespoke reporting on data to customers detailing their exact requirements for upload into their own platforms and systems in a seamless manner. The waste management expert’s fleet of blue, white and gold trucks and tankers have long been a familiar sight on Irish roads. They are fitted with second-by-second tracking systems that can not only pinpoint the location of a vehicle, but can also monitor any unauthorised stoppages, any excessive acceleration and braking, the volume of fuel used and the time the vehicle arrived and left the customer’s site. In keeping with its Duty of Care policy and environmental promise, Irish Waste ensures that the maximum amounts of waste received at its facility are processed there. This provides customers with the comfort and knowledge that their wastes have been processed and treated, and not transferred on to alternate plants and facilities. This in turn ensures that customer requirements under the Waste Duty of Care regulations have been met, and the waste has been delivered to the grave. Irish Waste places great emphasis on ensuring any waste produced at its treatment facility is recovered, reused or recycled prior to final disposal. Final waste disposal facilities used by the company are rigorously audited to ensure they are licensed and process the waste in an environmentally safe manner. Irish Waste’s treatment facility retains complete traceability for all waste streams received, processed and disposed of.